For most folks, this is it: this is the week when we finally get to go back to Middle-earth, and experience Peter Jackson’s first Hobbit movie, The Hobbit: An Unexpected Journey. Some of us, however, have had the great good fortune of seeing the film already, at press events around the globe. I was one such lucky viewer – and I present here my more-or-less spoiler-free review of what I saw. Walking through the morning commuting crowds, heading to the cinema, it was slightly bewildering to think that I was finally going to see this movie. It’s been YEARS – hoping since The Return of the King that we would get to go ‘back again’; handing out ‘Make the Hobbit Happen!’ buttons at conventions; watching the ‘snakes and ladders’ game of waiting for that greenlight; eagerly taking in every moment of Peter Jackson’s production diaries… And now, at last, here it is. Would the anticipation prove too much? Would I be disappointed? As the opening credits came up, I knew immediately that the answer, whatever was in store, would be NO. I was revisiting old friends – and what a great pleasure it was. I wanted to cry, as Frodo does in The Fellowship of the Ring, ‘It’s wonderful to see you Gandalf!’ What a treat to be back in the Shire, and to delight again in its green beauty. What fun to explore Bag End some more, and to see Ian Holm and Elijah Wood back where they belong – in furry feet! Some reviews have commented that The Hobbit: An Unexpected Journey feels too much like an echo of the earlier trilogy – too many parallels, which perhaps feel contrived. Those perils certainly exist, when revisiting a franchise: remember the James Bond team desperately trying to smooth over the replacement of Sean Connery with George Lazenby, by throwing in lines such as, ‘This never happened to the other guy!’? Fortunately, Jackson et al have dodged such pitfalls. They make no apologies, simply plunging in and enjoying being back. The fact is, we ARE back in Middle-earth – back in Peter Jackson, Alan Lee, John Howe and Weta’s Middle-earth – and it SHOULD seem familiar! These are many of the same characters, the same locations; should we expect them to be somehow different? In a recent interview, Richard Armitage commented that ‘connecting blood vessels to those other films [The Lord of the Rings trilogy] … was giving oxygen to our film’; Middle-earth breathes again because it is linked to the movies we already know – and that is an encouraging thought. This first of The Hobbit films does have a somewhat lighter touch than The Lord of the Rings movies, in keeping with the difference in Tolkien’s own style, going from The Hobbit to the later trilogy. An Unexpected Journey feels, in places, closer to a Jim Henson movie or a Goonies style kids’ adventure tale; and this unfamiliar flippancy was sometimes disorienting. It seems likely, however, with the way that plot events unfold, that The Desolation of Smaug and There and Back Again will be much darker – so perhaps it is as well to find the humour and the levity where we can! We see the characters having fun, enjoying each other and developing a rich camaraderie – which will make the dangers and darkness to come all the more poignant and frightening. The occasional frivolity of this movie is counterbalanced by the anchoring performances of its core trio – Martin Freeman, Richard Armitage and Sir Ian McKellen. These three actors are exceptional, and the intensity and focus which they bring to their roles give the film an essential weight and gravity. Martin Freeman never puts a (rather fat and chunky!) foot wrong in his portrayal of Bilbo – every moment, whether it be a scene of comedy, of danger or of emotion, is perfectly played. Richard Armitage gives Thorin extraordinary depth – this is a truly heroic character in whom we can believe as a leader and a potential king, but who is also a haunted, vulnerable being who carries heavy burdens of sadness and self-doubt. And McKellen is, of course, everything we want from Gandalf – funny, touching, wise: a formidable presence. How we will watch this triumvirate journey together, and see their characters’ relationships grow and change, is a thrilling prospect for the next two movies. The Academy is often churlish in rewarding ‘fantasy’ acting roles, but if there isn’t oscar buzz for these three gents – well, there should be. Not that the supporting cast is overshadowed! One of the great joys of An Unexpected Journey is that it is so well cast; everyone plays his or her role to perfection. Each dwarf is a delight – from William Kircher as the silent Bifur, who manages to communicate so much with his eyes and his grunts, to Adam Brown’s adorable Ori and James Nesbitt’s sparkling Bofur – and all the others in between. Ken Stott is particularly wonderful as Balin; as a long time fan of the Scottish actor, I was thrilled to see him bring such resonance to the role of Thorin’s old companion. As one would expect, Hugo Weaving, Cate Blanchett and Sir Christopher Lee recreate their particular roles with skill and mastery. The White Council scenes are beautifully played, and Gandalf’s interactions with Galadriel are a joy to behold. The only slight disappointment is that Saruman here is a difficult, ornery fellow, ever at odds with Gandalf. It seems a missed opportunity – to have discovered a real friendship here between the two wizards could have been a powerful and poignant set up for the destruction of that friendship in The Lord of the Rings. It would be remiss to leave out Andy Serkis in this roll call of excellence; his Gollum is better than ever – if that is possible – and the ‘Riddles in the Dark’ sequence is a highlight of the film. The perfection of the players in the movie is of course, in large part, a credit to their director. Sir Peter Jackson is known for being a technical wizard, but there is perhaps a tendency to overlook his further brilliance as an actor’s director. No film would be so full of pitch perfect performances were it not helmed by a master, who knows exactly how to draw such work out of his cast; how to lead them where they need to go and create for them a world in which they flourish. Directors don’t always get the credit they deserve for enabling their actors – Sir Peter certainly deserves much applause for what he has achieved here. So, what didn’t I love? Well, I’ve never been a huge fan of snot gags, but those slapstick moments in which Jackson loves to indulge are all part of the energy of the film, and they quickly pass, so they didn’t spoil my enjoyment. My only real issue was with the Higher Frame Rate – and even that was not quite the issue which others have found it to be. Much has been written about 48 frames per second, with some even stating that the visuals at this frame rate made them nauseous. I had no such problems, but I wasn’t convinced that this new technology is yet where it needs to be. The clarity is extraordinary, but rather than enhancing the viewing experience, this brightness somewhat mars it. At 48 fps, one sees EVERYTHING; this means that special effects, computer generated images, and edits do not blend as seamlessly as they would at a lower frame rate. The quality of artificial studio light, for example, is never quite the same as actual daylight; at 48 fps, in sequences where the close-ups were shot indoors and the wide shots on location, this slight shift in the light is evident and distracting. 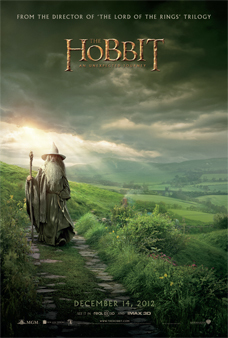 The extreme brightness and intensity of everything you see gives the film a rather cartoonish, ‘video game’ quality at times; rather than feeling that I was seeing right into that world of Middle-earth, I felt that I was gazing straight into the film set. 48 fps may well be the future, (and certainly 3D is much more effective at 48 fps), but the future isn’t here quite yet – the rest of movie making technology needs to catch up to this higher frame rate, so that the minor flaws aren’t exposed by the enhanced clarity. Such concerns were not significant enough to spoil my enjoyment of the film; I will certainly see the movie again at 48fps – and at 24fps. With such a team of experts at the helm – from director and actors to designers and crew, and not forgetting the magnificent, soaring score from composer Howard Shore – how could the film be anything but wondrous? I was left with the feeling that I had spent time with a friend whom I had not seen for years. For almost a decade, Middle-earth has only been what we’d already seen – we could revisit, but it was not new, not living and breathing. Now, here is our old acquaintance: returned, alive and well, and revealing new treasures! Hello old friend – it’s wonderful to see you again. I’m glad you’re back. This story is posted in the following categories: Adam Brown, Andy Serkis, Cate Blanchett, Christopher Lee, Elijah Wood, Hobbit Movie, Ian McKellen, James Nesbitt, Ken Stott, Martin Freeman, Peter Jackson, Production, Richard Armitage, The Hobbit No Comments » . Please click on a category name to view all stories related to it.